kids are quite impressed by road bike tyres and wheels. "wow, those are really skinny" is the phrase that more than i must have been regaled with on return from an amble around the countryside. that a grown man would spend much of his spare time riding the byways of islay on such narrow sections of rubber is obviously worthy of junior amazement. mind you, as albert einstein theorised, everything is relative, and by comparison with the wide and knobbly rubber on most full suspension mountain bikes, something as narrow as a road bike tyre must seem positively anorexic. road bike tyres are also rather impressive to adults too, though often more from the point of the pressures to which they are inflated. in weather such as currently experienced, i tend to sit around 100psi, but in those languid summer months, i usually add another ten to twenty psi. just because i can, you understand. if automotive tyres usually demand only 35 to 40 psi, squeezing 100 into something considerably smaller, must seem tantamount to sorcery. but adults are also just as impressed with the skinniness, now that you come to mention it. for all of the aforegoing, we must surely applaud the world's tyre and tube manufacturers, for if we stop long enough to consider, it does seem similar to the guys that walk the high-wire, that we can birl about on skinny bits of rubber and silicone inflated to pressures that would probably make a stupendous espresso. surely the ability to be safe on such a narrow strip somewhat denies credibility? width matters, or at least i must suppose it does since there are clearly defined zones attached to the offerings from the world's tyre purveyors. yet vittoria seem intent on confounding the accepted norms. 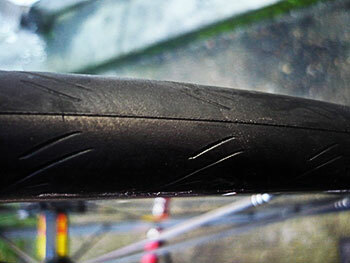 it's not so long since i reviewed vittoria's open pave clinchers inhabiting the space between the more regular 700x23 and the 700x25 that cushion the pothole blows on my cielo. a 24c tyre is not your common or garden tyre width. 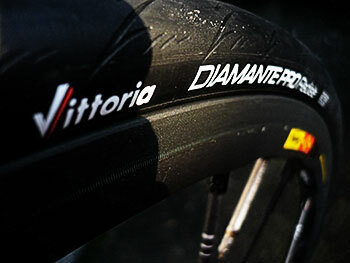 and here, yet again, vittoria seek to undermine the standard by offering their diamante pro clinchers in 700x22 dimensions. rarely would i ever quibble over one millimetre, and i tend to think i'm in the majority as far as that's concerned. though i cannot claim to have actually measured any of the tyres sent my way (where would i measure from and to? ), i have read anecdotal evidence regarding one mtb tyre manufacturer's 1.9" being another's 2.125". happily, none of this makes one real jot of difference, as far as i could make out, when riding the darned things. one less millimetre does, however, have its implications; there is a whimsy of additional harshness or stiffness (whatever you want to call it) on each ride, one that can be separated from the characteristics of the wheels. i'd fitted the diamante pros to a pair of mavic r-sys exaliths, wheels that have previously been home to mavic's own tyres as well as the aforementioned open paves. under these circumstances, i knew how the wheels behaved, allowing that factor to be filtered out. riding hard (something else that subscribes to relativity) provides inklings of professionalism, or at least in the manner i imagine the consummate professional experiences each daily distance. 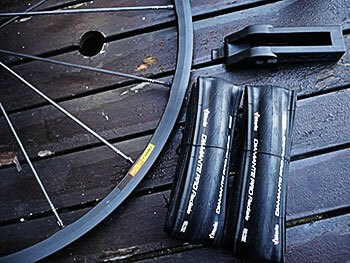 for the diamante pros are ultimately race tyres, items that will be ridden more by the great unwashed, but developed for and with the professional racer in mind. thus notions of harshness, subjective description though it is, are to be embraced and harnessed in the pursuit of unbridled speed. granted, i'm not sure i'd like to attempt the paris-roubaix sportive on a pair of these, but then that's what the open paves are for (the clue is in the name). the diamantes are also available in a 24c width, and feature a 220 tpi corespun casing and the almost inevlitable twin tread. the radiale version is subsumed by its compatriot in the rotating weight stakes, the diamante pro light which shaves around 30g. similar to the open pave, the tyre has a taller profile than its peers which may just explain that harsher road surface appreciation. however, that disparaged feature is also likely the very bit that makes these tyres so fast; perhaps losing that millimetre has added benefits that are a well-guarded vittoria secret. or maybe i was just fooling myself. what was not in doubt was the speed. even across seriously crappy roads, of which almost everyone has a myriad of examples, though every bump, dip and gravel section was experienced to the full, retardation was not one of the boxes finding itself ticked. that taller cross-section engenders notions of scary cornering, something i'm none too good at in the first place. yet after watching out for the first one or two experiences in case prognostications turned out to be true, skittishness was completely forgotten and the remainder of each ride enjoyed to the full. the smoothness of the tread isn't the ideal accompaniment to climbing on less than pristine, wet roads bearing more than their fair share of loose gravel, but i cannot deny that grip was better than i'd expected. however a bit of slipping and sliding was unavoidable. in fairness, i'd be very unlikely to fit tyres of this flavour at this time of year. these should undoubtedly be at their best come late spring, early summer and i'm quite happy to hang them on a hook in the shed to eagerly await these days. 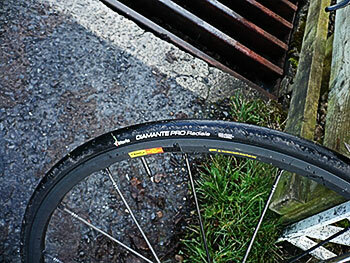 though the diamante pro radiales are perhaps better suited to differing and less harsh conditions, it is very much to their credit that they fared so well throughout less than ideal conditions. but that's the best time to test tyres; take them out of their comfort zone, do everything you really shouldn't and see whether they come out smiling. this pair are grinning like a cheshire cat.